The first half of this year was better than expected, but don’t count on a straight trend line. The month of July brings 110-degree weather to Phoenix and a welcome trip to San Francisco for Semicon West. It also means the year is half over and it’s time to assess mid-year market dynamics. Spirits were high last week at Semicon West. Most equipment vendors made significant revenue gains in the first half of 2014 and expect the second half of the year to be just as good or even better. Driven by the transition to ‘inflection technologies’ such as 3D NAND and FinFETs, both Applied Materials and LAM Research are reporting double-digit revenue gains compared to the same period last year. SEMI released its mid-year Capital Equipment Forecast, which projects a 20.8% increase in total semiconductor equipment sales for 2014. TSMC reported a record second quarter resulting in a year-to-date revenue increase of 14.8% over 2013. Intel also reported a better-than-expected second quarter with sales up 8% year over year. Semico has been forecasting a 3% recovery for PC sales in 2014 based on improved sales of convertible notebooks for business applications. Oddly enough, Dell halted online sales of Chromebook 11 due to unexpectedly strong demand. Chromebook 11 was targeted at education customers. Its been reported that Dell will release a new Chrome OS laptop later this year. Although the first half of 2014 has resulted in record-breaking semiconductor sales, Semico remains cautious about the second half of this year. During the first half of 2013, the Semico IPI Index increased, accurately predicting the strong market for the first half of 2014. However, the IPI declined from May to December 2013 pointing to below seasonal growth for semiconductor demand in the second half of 2014. 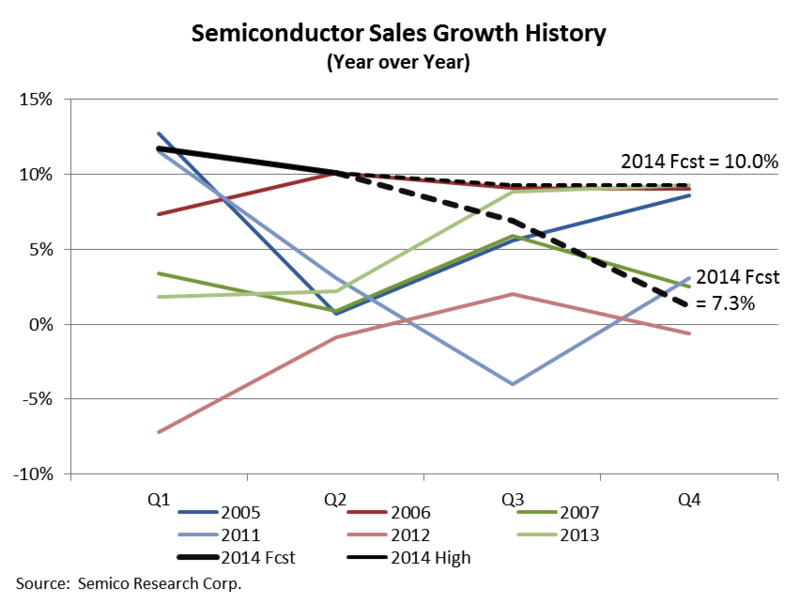 Semico’s 2014 semiconductor revenue forecast stands at 7.3% growth. Based on the graph below, one might conclude that a 10.0% forecast looks very likely. However, to reach that 10% year over year growth, semiconductor sales would have to be over $183 billion in the second half of the year. First half revenues will be only slightly over $165 billion.